Home » Conversations » The chef. I sit at this restaurant as big as my kitchen, order my first meal of the day, a dirt cheap plate of a mix of Thukpa and Momos. A guy outside visibly drunk demands for a job from the owner, and she says "I don't hire alcoholics", the guy moves on. A person visibly from a long staying tourist, adds "Except Shyam". 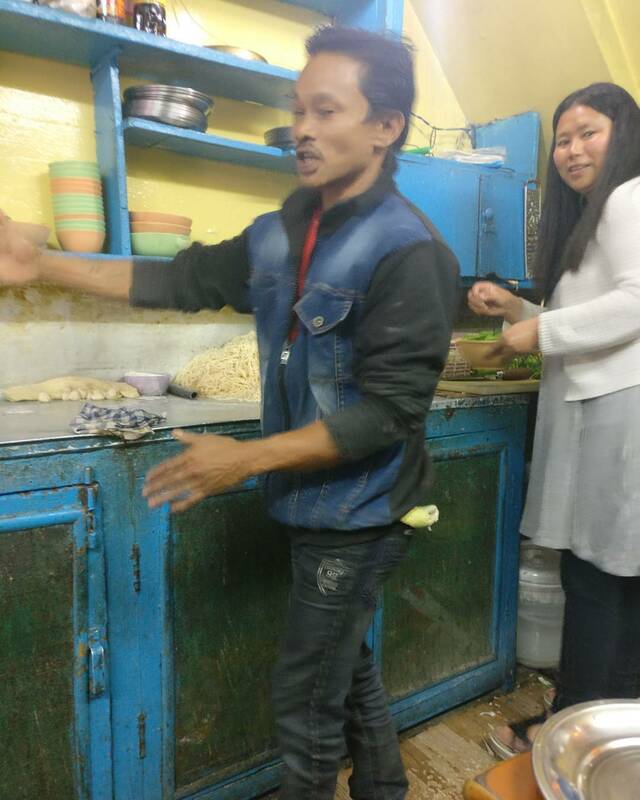 A short thin and active man who is chopping the vegetables chuckles, and the owner snorts a laugh too. The tourist continues, " You won't be able to tell that this smooth chopper is drunk, he's always drunk", I just add a smile, the owner laughs and agrees, Shyam silently continues with the work. The tourist asks Shyam where he gets the Hair cut, "I do it myself, I worked as a barber for two years in Agartala"
"I have done a lot of things in my life, I was a barber in Agartala, a rickshaw driver in Kolkata, a farm labourer near Chandigarh, worker as a cab driver in leh, I even was a coolie in Delhi"
The tourist repeats the word coolie with surprise. "Yeah, once I was hungry and saw someone looking for a coolie, went upto them and asked if they needed help, they said yes, I picked up thier luggage on my head, as a kid I have seen all I thought was Amitabh Bacchhan was a coolie, why can't I be one?" We all laugh, he joins us too with a smile. My plate of Thukpa arrives, and we go on discussing more on the life of Shyam, his love affair with a cute Nepali girl, and how when he dies people from Agartala will come to get his body.